Looking for a guide that shows you step-by-step how to make some of the more advanced types of sushi that you find in restaurants? If you're an iPhone owner, Luckily for you, there's an useful iPhone app for sushi-lovers who want to learn how to make delicious sushi. 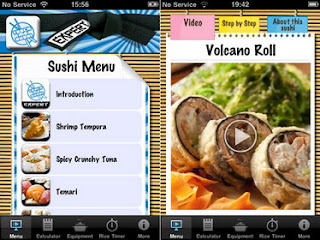 This easy to follow iPhone app is a follow up to the Teach Me Sushi app that was featured as the iTunes App of the Week. The app features over 45 minutes of video broken up into easy – 5 minute long sessions. In Teach Me Sushi Expert you will learn how to make 8 different types of advanced rolls including Shrimp Tempura, Volcano Rolls and Spicy Crunchy Tuna rolls. Teach Me Sushi Expert for iPhone is available for download $4.99 on the App Store in the Lifestyle category. 0 comments on "Teach Me Sushi Expert iPhone app released"